Few countries issued any gold coins after 1932, and most of these were commemoratives. Britain for example issued no bullion sovereigns between 1932 and 1957. 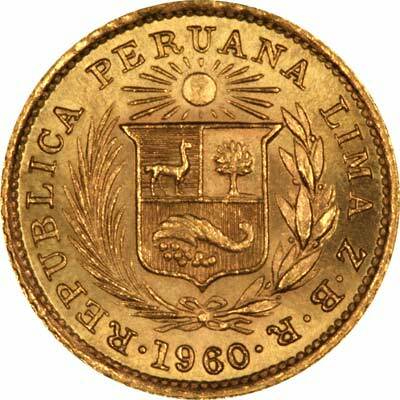 Peru is one of the few countries which continued to issue bullion gold coins for most of this period. The Inca empire centred on Peru once ruled much of South America, but was already in decline when Spain began its conquest in 1531. The Incas worshipped a sun god, and the warm yellow glow of gold was believed by many ancient civilisations to belong to the sun gold, or be related to the sun in some other way. 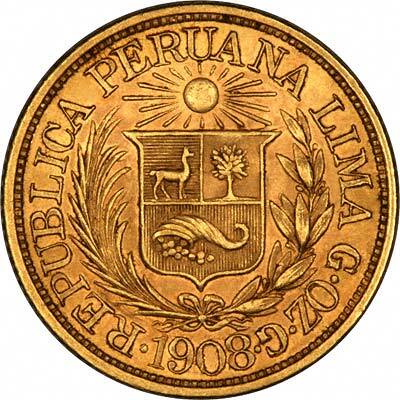 Peru claimed independence in 1821, and this was eventually recognised by Spain in 1879. Peru and Bolivia were briefly united from 1836 to 1839, Simon Bolivar is recognised as a hero in both countries, but this met with Peruvian resistance and Chilean intervention. South and North Peru issued their own coinage shortly after this. Peru lost territory to Chile in the War of the Pacific from 1879 to 1881. Discovery of silver at Potosi in 1545 lead to Peru also issuing large quantities of silver coins. 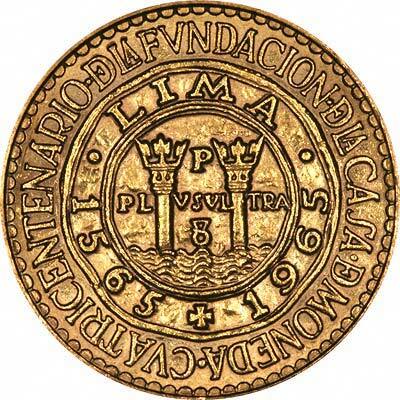 We often have a small selection of Peruvian gold coins in stock. We show the specifications here of the most frequently held coins, including links to the various different denomination pages. Because Peru made gold coins in many years when they were not issued by other countries, it can be a good source for impossible dates in other series. Gold coins are of course popular gift items, and 1956 for example does not exist in gold sovereigns or half sovereigns, but it is available in several denominations of Peru's coins. Technical specifications of the most frequently encountered Peruvian gold coins. For silver and base metal coins of Peru, please look at our original Chard Coins website. 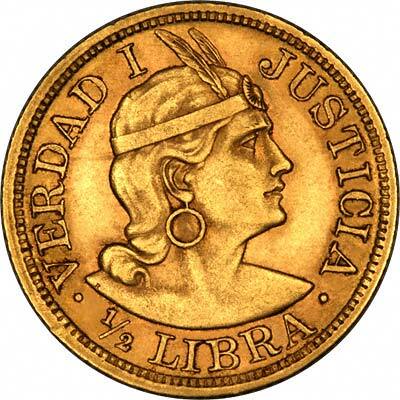 We make an active market in almost all world coins, gold or otherwise, including Peruvian gold coins. If you have any of these coins to sell, please contact us, or post them to us for appraisal and offer.